There's no law which says you need to carry out PAT Testing on your equipment, but you are, of course, required to make sure that it's safe! At some point, you're going to need to get it PAT Tested, and that means you're going to need to put a sticker on to prove that it's been tested! 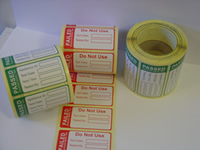 This site can help you find PAT Testing Labels, as well as all the other accessories you will need, including plugs, fuses and tools! Welcome! If you carry out PAT Testing - whether you test your own equipment, or carry out a PAT testing service to other people, this site has been created to help you find the products that you need.